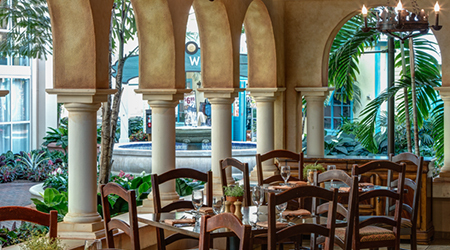 Spend New Year’s Day enjoying signature dining at Villa de Flora’s Mediterranean buffet! Our chefs have created a feast for the senses, making this one of the most popular restaurants of its kind in the state of Florida. Chefs stationed at six markets invite you to sample their culinary creations, including a seasonal market-inspired menu with entrees from the Mediterranean. * Reservations must be cancelled at least 48 hours in advance for full refund and are non-refundable after this time. * Listed prices are exclusive of tax & gratuity. * An 18% gratuity will be added to all pre-paid purchases and parties of 6 or more. * Self-parking included in price. * All menus subject to change without notice. * For parties of 15 or more, please contact our Restaurant Sales Manager at (407) 586-1304.